Chronic kidney disease is on the rise in South Africa, and we’re not looking too healthy. It’s estimated that at least 15 percent of South Africans suffer from kidney disease. Why such a dire statistic? The kidneys are major organs in our body and support a lot of different functions of the other organs. Think of the kidneys as key supporting actors in your body. These bean-shaped organs are filters. Every day, the kidneys sift through about 150 litres of fluid of which about 148 litres of useful substances like protein is cleansed and reabsorbed, while the waste is excreted in about two litres of urine each day. Produce essential chemicals which control your blood pressure. Create substances that produce red blood cells, which carry oxygen throughout the body. Break down and destroy unnecessary or dangerous chemicals and hormones, like insulin. Retain and provide the necessary nutrients to nourish bones and joints, allowing for a stable and healthy skeleton. Control the amount of acidity and alkalinity (pH) in your body, i.e. keep your blood clean and chemically balanced. Eliminate toxic waste from the body. Are you at risk for kidney failure? In South Africa, kidney failure is mainly from inherited high blood pressure. High blood pressure (hypertension) places stress on the blood vessels throughout the body, including the kidneys. Hypertension is particularly dominant amongst the black population – the incidence of kidney failure is four times higher than in other groups. Another contributor is Type 2 diabetes. Diabetes is characterised by high blood glucose or blood sugar levels, and over time, may result in the kidney filters essentially being blocked. More than 50 percent of people with diabetes will develop kidney problems. A family history of kidney disease can also put you at risk for kidney failure. Other risks include inflammation of the kidneys, blockages (such as kidney stones), and trauma to the kidneys (kidney injury). What happens when the kidneys shut down? Dialysis filters and purifies your blood via a machine. It helps keep your body in balance when the kidneys can’t function properly. There are two types of dialysis, namely haemodialysis and peritoneal dialysis. Haemodialysis requires a minor operation to allow access to your bloodstream, usually through the wrist or chest. Blood is then removed from the body and cleansed by an artificial kidney attached to a dialysis machine. As your blood is filtered, it’s returned to your bloodstream. Each treatment lasts for four to six hours and is done three times a week. Peritoneal dialysis is done inside the body, using the body’s peritoneal membrane – the lining of the abdominal cavity – as a filter to clear waste and cleanse the blood. It also requires a minor operation, but this time a catheter is inserted into the abdomen. The catheter acts as an entrance for the dialysis solution. After a few hours, the used solution is drained and refilled with fresh cleansing solution to begin the process again. This treatment takes place four times a day, seven days a week, and can be performed almost anywhere. A kidney transplant places a healthy, functioning kidney from another person into your body. The kidney may come from a deceased donor or a living donor, usually a close relative, spouse or friend. It can also originate from an organ donor. 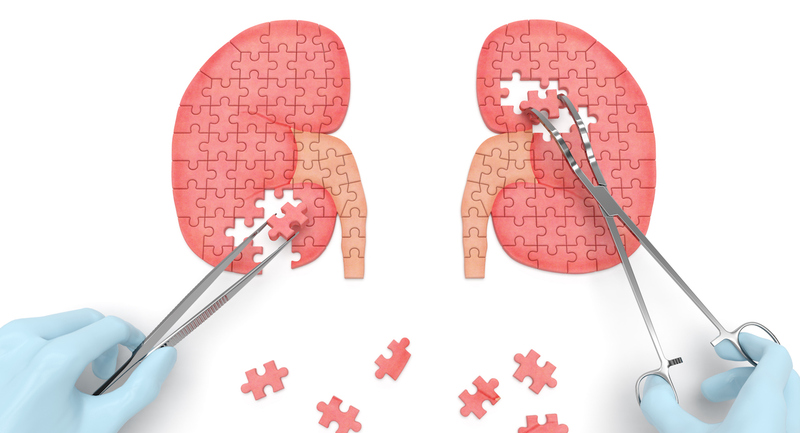 The average waiting time for a new kidney varies, but can be anything between six to 12 years.